I am very happy to be here and be able to recap the fall. The fall athletic season ended on a phenomenal note. All high school teams made it into the postseason. Nicole Martin, an SHS senior, was even named a member of the Boston Globe All-Scholastic Field Hockey Team. As a member of Nicole’s team I can honestly say nobody deserves it more, she is as kind a person off the field as she is talented on the field. The first football game at the Deconto stadium – on turf and under the lights – was played last Friday. Even though it was freezing, many fans braved the cold to support the team and the graduating seniors who were being honored that day. There are plans for both a celebration honoring those who were instrumental in the stadium’s construction and a Spring dedication where multiple sports teams will have the opportunity to play on the turf. The Thanksgiving football game will be played at Mashpee with a 10 o’clock kickoff. 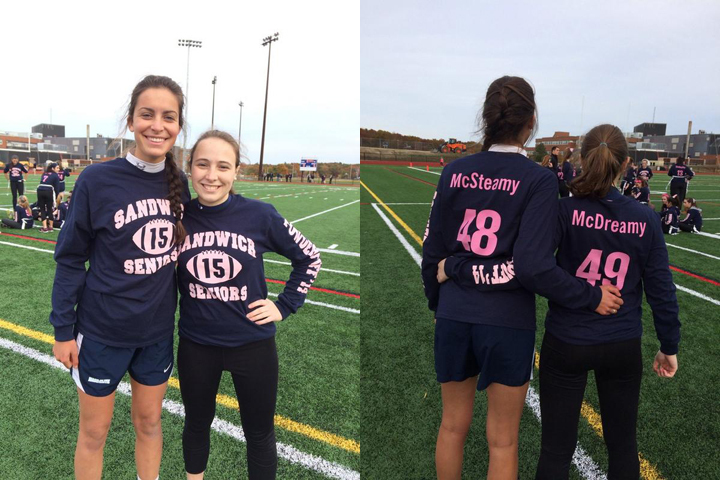 Powderpuff Team Members – Representing Class of 2015! A week before that inaugural home game was held, a similar contest took place: the annual Powderpuff game. It was a highly contested game, even going into overtime, and tensions were running high between the junior and senior girls. In the end, the senior class of 2015 did come out on top and has since been awarded with eternal glory. Thank you to Student Council for organizing the game every year. It was a blast! Sign ups for winter sports have begun and all winter athletes are excited to begin the Monday after Thanksgiving. Thank you to Mr. Murphy who has made this past season into the smooth success it was. High school and STEM Academics have been equally successful. The first round of report cards were made available last week via PowerSchool. Dr. Booras was very proud of the combined academic success of grades 7-12. One example of this success could even be found in the Cape Cod Times on Veteran’s Day. Maria Cahill, a first year teacher at SHS, teaches a STEM Academy elective called “News to Me” in which students are able to write their own news stories. Maggie Mahoney, Ms. Cahill’s student, wrote the article about patriotism titled “Who’s Worth More?” that was published in the Cape Cod Times. You can read Maggie’s piece here. The elective connects directly to the SHS journalism course and its existence, like so many other STEM Academy electives, bodes well for the corresponding high school program. Ideas for new STEM Academy electives will be shared at the next meeting. The first STEM Academy dance was held last Friday and it went incredibly well. The high school front lobby and gym were decorated in blue and white in preparation for the nearly 400 students who would attend. Special thanks to parents, teachers, chaperones and the STEM Academy guidance counselor and student council advisor, Lauren Wentworth. Parent-teacher conferences are being held now. High school conferences are a conversation about student work guided by the expectations established at the beginning of the year. They were being held this morning, tomorrow morning, and tomorrow night. STEM Academy conferences were held this morning, tonight, and tomorrow morning. The arts have been equally busy this fall. STEM Academy art work, made under the direction of Ms. Mills and Ms. Ganju, is being showcased in the bottom floor of the STEM Academy building. It’s impressive. At the high school, talented seniors are putting together their portfolios and sending them out to some of the most renowned art schools in the country. This Friday night is also the opening of the Knight Theater Company’s Fall production “The Runaways.” 7th through 12th graders were able to participate in the play. Everyone involved says it’s not just entertaining but thought provoking, the plot revolving around homeless teens in New York City. With the choice of this play, and the three others they’ve overseen, the performance’s director Kevin Lasit and vocal director Melinda Lasit have done a great job of gauging the high school audience’s readiness for the subject matter. Under their supervision and the musical direction of John Williams, each play has been a major triumph. In the spirit of the play, KTC has been collecting canned goods throughout November to donate to the Sandwich Food Pantry. Money donations will also be accepted at each showing to be donated to the Hyannis-based organization Street Reach. Performances are this Friday at 7 and this Saturday at 2 and 7. Everyone at SHS is excited to see it. I know that I am so excited that I am willing to skip the premier night of the new Hunger Games movie so that I can see the premier of the Runaways. Winter marks the beginning of the high school concert season, a full line up of which I’ll have at the next meeting. Sandwich Soul will be performing at the Daniel Webster on the fifth and Heritage Museum and Gardens on the thirteenth. A choral concert for parents will be held on December 12th and an instrumental concert on the 18th. These concerts will be performed for SHS and STEM in school on the 23rd. Fall at the K-8s has been equally as busy. The Wing School has recently had great success with students bringing in Box Tops. The Box Tops helped purchase everything from art supplies to pedometers. Thank you to the Wing PTA for arranging the drive. Box top donations are still being accepted. Fifth graders at Wing collected essentials to donate to the NOAH Shelter in Hyannis throughout October. They set out to, and succeeded in, proving that the smallest acts of kindness can make a big difference in the lives of our neighbors. Forestdale students have also done this. Sixth grade student council is currently conducting a Food Drive for the Sandwich Food Pantry. Information about their next project, a coat drive, will be coming soon. In October, Forestdale students were also able to take part in multiple hands on learning activities: attending a concert at the Cape Cod Symphony Orchestra, a presentation by the Freedom Scholars, and visiting Plymouth Plantation. 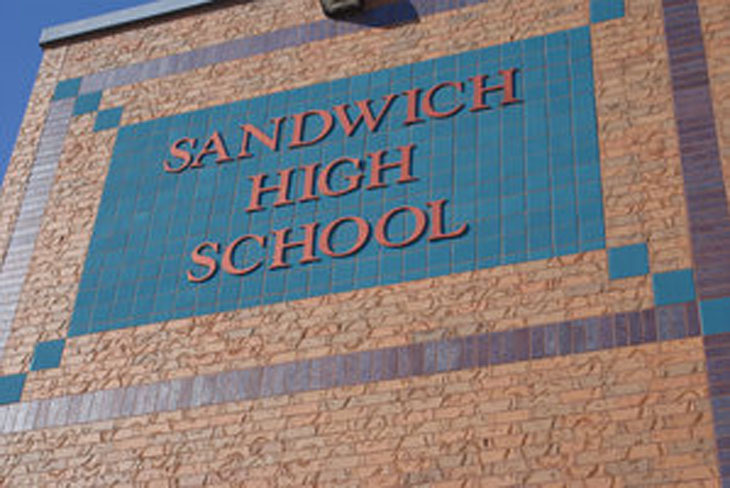 In all cases, Mr. Smith said his students made Sandwich proud. Oak Ridge recently kicked off Gratitude week, creating displays, reading stories, and reflecting on what students are most thankful for. Special thanks to the Oak Ridge Respect for Human Differences Committee. Oak Ridge would also like to thank local authors: Mark Jasper and Kathy Dayan for coming to the school to read to the students. All of the Elementary Schools also want to remind parents of K-6 students that the K-6 schools are on Trimesters, the 1st semester ending on December 1st. Report cards will go out on December 8th and Parent Conferences will be on December 10th and 11th. As you can tell it has been an eventful fall. The transition into Winter means the annual raising of the Sandwich High School Blue Knight light fixture. The giant looks over and lights up Quaker Meetinghouse and, this year, will be joined by a STEM Squire. A group of STEM students have been lucky enough to work with Mr. Magyar in the construction of the new giant. Both will be raised soon. This is just one of the many annual events we have to look forward to this winter. Thanks!